The Airport Link is a subway line that connects Bangkok’s main airport, Suvarnabhumi Airport, with the city center. One of the advantages of this line is that it’s much cheaper than using a taxi, and you avoid the stress of daily traffic. In reality there are actually two lines of the Airport Link: the City Line, which costs 45 THB (about 1.20 USD), which stops at Phaya Thai, Rathchaprarop, Makkasan, Ramkhamhaeng, Hua Mark, Ban Thap Chang, Lat Krabange, and Suvarnabhumi Airport. And the Express Line, which costs 90 THB (about 2.30 USD) that directly connects Phaya Thai (in the city center) to the airport, with Makkasan as the only intermediate stop. The entire trip takes about 30 minutes, making this a quick and convenient transportation choice. The Airport Link connects with the MRT (or metro system) at the Makkasan station and with the BTS (or Sky Train) at the Phaya Thai station. Tokens – or tickets – can be bought directly from automatic machines after entering your destination (usually Phaya Thai or Makkasan). Once your trip is over, the token will be taken back via the exit gate and recycled (so don’t lose it!). As I mentioned, the Airport Link connects that airport to Bangkok’s city center. When in the city center you can choose one of two types of metro. The first is the BTS (or Sky Train), which is not exactly a subway line but rather an elevated rail; divided into two lines: the Sukhumvit Line, which goes from Mo Chit to Bearing, and the Silom Line, which goes from the National Stadium to Wongwian Yai. The BTS is a cheap, fast and scenic way to cross a good part of Bangkok, from the main commercial centers, to the weekend market at Chatuchak, Sukhumvit Road, and even the river are all accessible via the BTS. While the Silom Line runs west to south, the Sukhumvit line runs from north to east. If you’ve never been to Bangkok, it’s a great way to see a good portion of all that the city has to offer. Service runs from 06:30 to midnight, but watch out for rush hour times (07:00 – 09:00 and 16:00 – 19:00) because the trains can be truly bursting with people, so much so that you don’t even have to walk to get onto the train since those around you will push you forward until they get on themselves! Ticket prices start at 15 THB for one stop. The so-called Rabbit Card is commonly used, which is more convenient than single use tickets that you have to buy each time, even having to wait on line for one of the automatic machines. The Rabbit Card is a card – similar to London’s Oyster Card, – which is charged with a credit of THB, from a minimum of 100 to a maximum of 4,000, and is good for 5 years. Rabbit Cards can be bought for 200 THB, of which 50 is for a deposit, another 50 as a tax and 100 as credit to be used. The best ticket for tourists is the One-Day Pass which for 120 THB gives you unlimited travel during the entire day. for 50 rides, an average of 25 THB per trip, with unlimited distances, costs 1,250 THB. 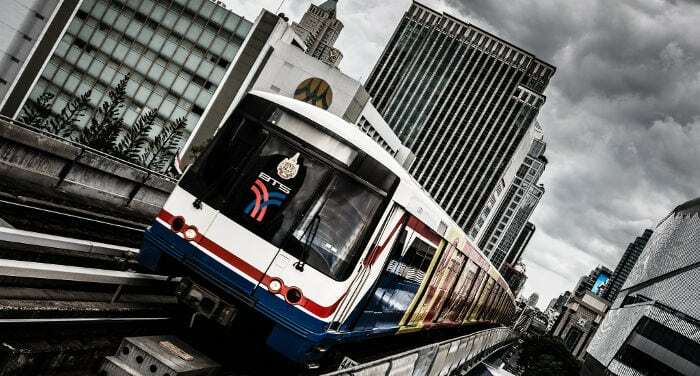 The Bangkok Metro system, best known as the MRT, has only one line that goes from Bang Sue to Hua Lamphong, where you’ll find the city’s railway station. The line is underground and separate from the BTS. There are connecting points between the BTS at Chatuchak (at the BTS station of Mo Chit), Sukhumvit (with the BTS station of Asok) and Silom (with the BTS station of Sala Daeng). Ticket machines accept bills (as opposed to the BTS which only takes coins of 1, 5 and 10 THB) and don’t give out tickets but rather black colored tokens. In the metro there’s no eating, drinking or smoking allowed. All trains are air conditioned. The full cost card for all adults, which costs 180 THB (100 THB credit + 50 THB deposit + 30 THB ticketing cost). To recharge it you’ll have to go to the ticket counter. The card can be used at all 18 stations of the MRT. With thisn card, children up to a height of 90 cm can travel for free. For kids between 91-120 and up to 14 years old, the card offers a discount of 50% of the price of the ticket. This card costs 180 THB as well. This is a card for adults that allows unlimited trips for an entire day. It can be bought at the ticket counter and costs 120 THB. There is no deposit and it is non-refundable. This is a ticket that allows unlimited rides for 3 consecutive days. You can buy it at the ticket counter and it costs 230 THB. There is no deposit and it is non-refundable. This is a card for adults that allows unlimited trips for 30 consecutive days. You can buy it at the ticket counter and it costs 1,400 THB. There is no deposit and it is non-refundable. If you want to go to Chatuchak Market, don’t get off at Chatuchak station but at Kamphaeng Phet instead. Other than the BTS and MRT, the simplest and most convenient way of getting around Bangkok is by taxi. The majority of taxis are new and spacious; in addition to the traditional yellow-green and blue-red colors, there are orange, red and even pink taxis that are quite pretty. Hailing a taxi isn’t the hassle it can be in Europe, especially around hotels, shopping centers and other tourist attractions. When you come to Bangkok you’ll note that the majority of cars are taxis and stopping one isn’t at all difficult. The rate starts at 35 baht and is good for two kilometers. After that, the rate goes to 2 baht for every kilometer. There’s a mark-up of 1.25 baht when traveling less than 6 km an hour (something that has never happened to me). If you take a taxi to the airport the rate will be about 300 baht, obviously depending on how much traffic there is. Communication can be a problem with the majority of taxi drivers in Bangkok, since they often speak little English. In general, taxis are always to be found in a city that never sleeps, are a good value and are available practically 24 hours a day. Meters are present in all taxis but some drivers don’t start it because they want to negotiate their own price with you, so it might save time if you ask them to just start it. Since taxis are cheap and the drivers work 24/7 a small tip is generally appreciated. The famous tuk tuks found throughout Bangkok are small vehicles with three wheels, running on very loud motors (usually on gpl), decked out in a ton of flash, sounds and lights. Tuk tuks have become the most recognizable form of transport in Bangkok; taking a ride in a tuk tuk is more of a life experience than a practical way of getting around. Usually these are used for short or mid-range trips; also the rate needs to be negotiated before starting. In a city like Bangkok, tuk tuk drivers often overcharge unsuspecting foreigners, so try to go lower with the price; you certainly won’t be able to take a ride for 10 THB. For example the trip between the station and my school is about about a kilometer and a half, and the rate is usually 20 THB. Note that if you have others with you, the price is not per person, which means that with 5 people in the tuk tuk you’ll pay 20 or 40 THB. As I said tuk tuks are ideal for short trips. At times it would be more convenient to just take a taxi to the same destination but you’ll get there more quickly with a tuk tuk. The Thailand State Railway offers rail service throughout the country for a very good price. The majority of long distance trains leave from Hua Lamphong station which, as has already been mentioned, is the last stop of the MRT. The four main rail lines, which cover about 4.000 kilometers go to the north, northeast, east and south. Trains that go to the north and northeast also stop at the Don Muang airport station (Bangkok’s secondary airport). There are four types of trains: ordinary, fast, express and special express, and three classes of service: first, second and third. Government run buses, which are cheaper but also slower and without air conditioning. These buses are orange in color and stop anywhere and take on passengers along the route. Blue buses have air conditioning. This type of bus, run by both the government and private companies is quicker and more comfortable. Sadly the number of air conditioned buses is less than those without. Normally there are two classes of air conditioned bus: normal and first class; in the latter they also have restrooms on board. Click here to read our guide on how to travel around Thailand by bus. I'm Italian and I graduated in International Relations. I like to spend the summer nights, but also during cold winter evenings, watching the stars with my trusty telescope. I love music and technology. I hope to inspire your curiosity about travels and what this stunning world can offer.